Tonight we decided to try Puerto Rican food. 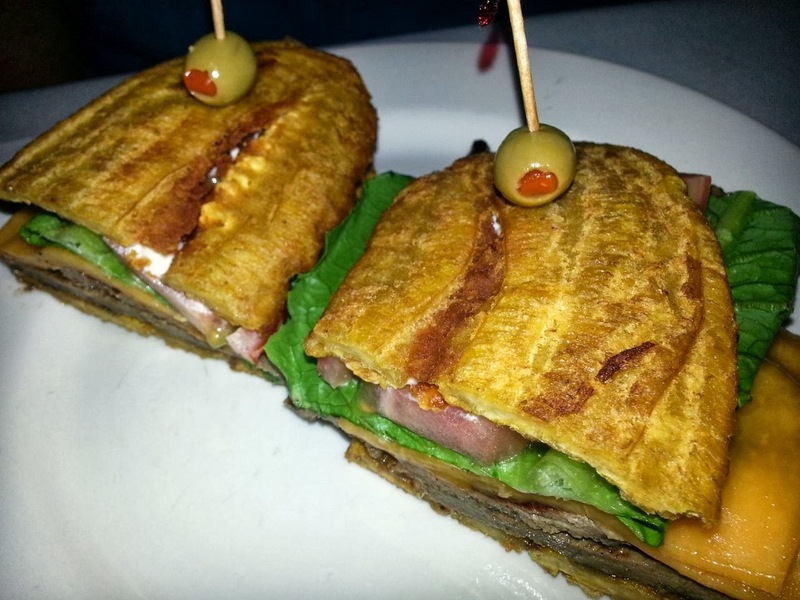 We like Cuban food, and we assumed it would be kind of similar. I had a Groupon for Mofongos in North Hollywood which is the only Puerto Rican restaurant in Los Angeles (at least according to their website). The food had good reviews on Yelp, so I felt optimistic. We arrived around 8:30pm on a Thursday night. The restaurant was almost empty. I'm not terribly surprised considering it's not all that easy to find. We had the address programed into our GPS and still didn't see it the first time we drove by. We were actually able to find street parking right out front, which was a nice surprise. The waitress was nice and pointed us to a table. She brought us menus to look over and explained about the dish they're known for, mofongos. A mofongo is a traditional Puerto Rican recipe. 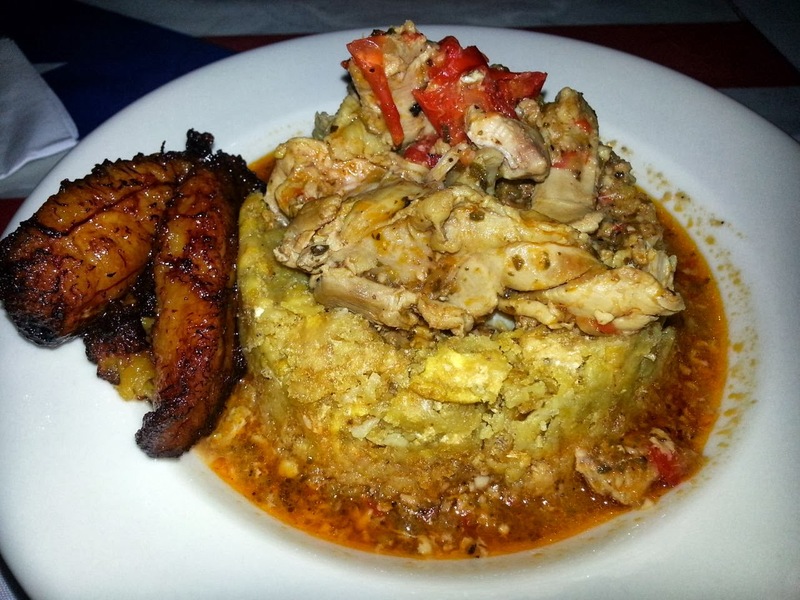 It is made from green unripe plantains mixed with chicken crackling, garlic, and other spices. It is traditionally topped with a chicken broth. At Mofongos, they serve it in a cup form with chicken stew in the middle. The waitress said the Mofongo de Camarones (a mofongo stuffed with 6 jumbo shrimp) is their most popular dish. We decided to start with the appetizer sampler platter, "De Todo un Poco Platter." 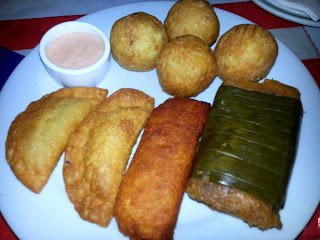 If you reference the picture, the round balls on top are Relleno de Papa, potato balls filled with beef. The only other place I've had potato balls was at Porto's. The ones at Porto's are denser and spicier. These were much bigger than the ones at Porto's, and the outside was kind of like a shell. I cracked it open with my fork, and the meat separated from the potato. It was good, but I'm partial to Porto's. Starting from the left, the platter included one beef and one chicken pastelillo. A pastelillo is an empanada. I tried the beef one. It was good but kind of just tasted like beef and grease. That's just my opinion. If you like empanadas, you'll probably love these. The platter also included one beef alcapúrria. The dough on the outside was made from cassava (yuca). This was my personal favorite. The final item on the platter was a pork pastel, which is on the far right of the picture. It's a pork filled banana tamale. This was my second favorite. I told my husband, "I'm not sure what I'm eating, but I like it." I tasted the dipping sauce but didn't use it. My husband thought it tasted like ranch mixed with ketchup. I thought it tasted like flavored mayo. Between the two of us, we tasted everything on the platter, but we only ate about half of the food. We wanted to make sure we were hungry enough for our entrees. My husband kind of wanted to try the Cubano just to compare it to the one at Porto's, but he ended up ordering the Jibarito de Bistec, which consisted of thin sliced steak, cheddar cheese, lettuce, tomato, and mayo on a plantain bun. You had me at "plantain bun." I tasted it, and the plantain bun is kinda awesome. I may need to learn how to make those. It'd be great for someone who has a gluten intolerance, or just someone who loves plantains! I decided to order a mofongo. That is what they're known for after all. The tough part was deciding which one to try. In the end, I went with the Mofongo de Pollo Guisado, which was a mofongo stuffed with savory chicken stew with bell peppers. It was amazing and big. I could definitely get used to eating mofongos! The chicken stew could've been spicier, but it was perfectly tender. It came with a side of either fried green plantains or fried sweet plantains. Per the waitress's suggestion, I went with the sweet plantains. They were so good, sweet enough to be dessert. It was a lot of food, especially after the appetizer platter. My husband helped me eat everything, and we still had leftovers. Of course, there's always room for dessert. 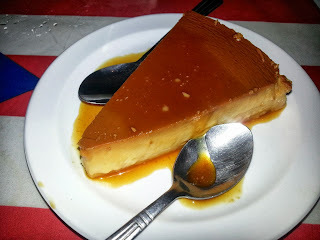 We decided to share the Flan de Queso, which is a cheese flan topped with caramel. I'm usually not a huge flan fan, but this tasted more like cheesecake. It was really thick and was dripping with a caramel sauce. I liked everything that we ordered, but the flan was my favorite part. I'd be happy just going to Mofongos for flan, but I'd probably get a mofongo too. The atmosphere leaves a little to be desired, but the food and service are great. I'm sure we'll be back. If you're in the L.A. area and want to travel to Puerto Rico through your taste buds, you must go to Mofongos! Check out their menu at http://mofongosrestaurant.com/menu.html.